the end of October in most Western societies, particularly the U.K., Canada, and the U.S., is typically associated with Halloween. this time of year, however, is also celebrated by other non-Western societies, primarily in Latin America, with Dia de los Muertos (in English: "the day of the dead"). in countries with heavy Anglo and Latin influences, these 2 celebrations have largely become conflated. with Halloween falling on October 31 and Dia de los Muertos falling on November 2, the 2 events have merged into an extended holiday. throughout most of the southern and western areas of the U.S., for example, people of all cultural backgrounds have come to largely treat the last weekend in October as a 3-or-4 day vacation with an excuse for enjoying celebrations with ghoulish and supernatural themes, consuming mass quantities of food and drink invariably loaded with sugar and alcohol, and wearing outlandish costumes well outside of personal inhibitions. prior to the modern era the 2 holidays came from recognizably different origins. Halloween is largely seen as arising from the Celtic pagan traditions, while Dia de los Muertos is more associated with pre-colonial indigenous practices in the Americas. despite this, the 2 holidays share a number of similarities apart from their time of celebration: both are believed to indicate a time when the barriers between this life and the afterlife allowed spirits to pass through, both are seen as a time when the living could commune with the dead, and both were taken as a time to commemorate the deceased. 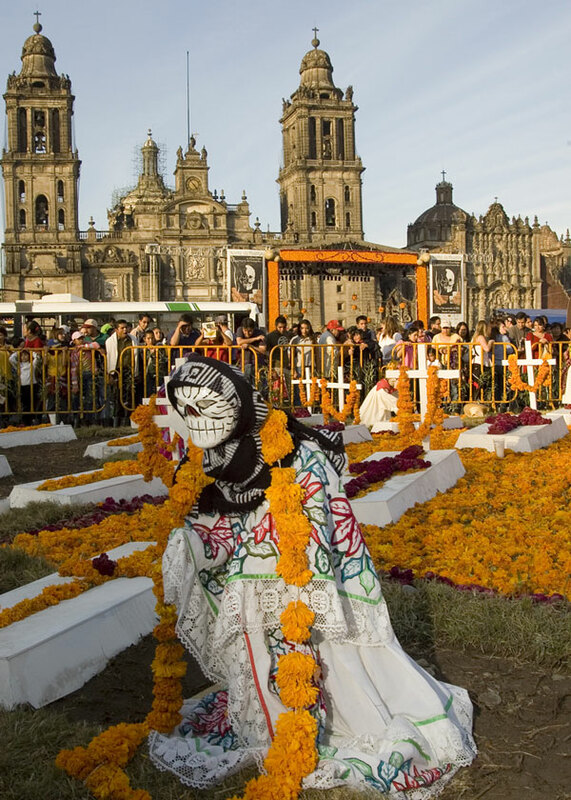 such beliefs are maintained in various ways by various societies around the world, but Halloween and Dias de los Muertos benefited from the mutual influence of the Catholic Church, which mingled their respective cultural origins with Christianity and thereby morphed the 2 so that they became separate but overlapping celebrations observing many common practices and themes. living in Southern California, i've had the opportunity to watch both events--which in Los Angeles, consistent with the rest of the southern and western U.S., are largely just 1 big one. however, coming from a Northern European background (or at least, a mish-mashed agglomeration of randomly selected Northern European and Southeast Asian cultures), i've always been more fascinated by Dia de los Muertos, albeit not so much in the modern incarnation it shares with Halloween, but moreso in its older form maintained by more traditional Catholic Latinos. what i find intriguing is the modes of celebration. some of it i find very familiar: remembering the dead through attendance at church or visits to graves, communion with prayer, moments of reflection, etc. some of it, though, i find somewhat unfamiliar and thus more intriguing: using joyous celebration and vigorous activities for times that i would consider to be somber and peaceful. but in a way, i think that this isn't really anything that strange. because what's essentially happening is that people are choosing to remember the dead in ways that respect life--the life of those deceased, the life of those still living, and all of life in general. and the way they are choosing to respect life is not through sorrow or grief or loss or despair, even as much as that is part of how the living relate to the dead, but rather instead to respect life through happiness and joy and progress and triumph, because that is also very much a part of how the living can honor the dead: by affirming that life goes on, and that life is to be lived, and that the dead would want us to do so. and this is something that i was taught in my own heritage and something that i very much believe and something that i always make a point to remember for all the loved ones that i have lost: that we the living must live for the dead, to live the lives that they could not...because they would want us to do so. and as much as i have held on to this thought in the course of my daily living, i have even more so held on to it in my racing. because i know that my involvement in activities as so vigorous as sports is in all honesty an intensely personal experience marking a deeper journey towards a greater understanding of life and a closer realization of existence reaching supreme truths that all the dead who have gone before me would have wanted me to know: the joy of God. and that's no different than what Dia de los Muertos is doing. Fran's death in competition has come as a shock to people in the sports community, partly because things like this are not common occurrences in elite-level sports events, partly because he had no apparent history of medical issues, and partly because it runs so contrary to public perceptions of athletes and athletic endeavors in relation to personal health. it's just not expected to hear of elite-level athletes dying in the middle of competition. it's possible to name examples, Reggie Lewis (Boston Celtics of the NBA, who collapsed and died in a game) being a famous one, but the fact that they can be named is an indication of just how rare and unexpected an event like this can be. i won't comment on the veracity or plausibility of the statements in these articles, since 1) i don't know enough to evaluate them and 2) the investigations (at the minimum, by USA Swimming, FINA, and UAE) are still ongoing and i want to give them a chance to produce their findings. i will, however, comment on some things which i think relate to sports at large. something was not right. and i mean wrong. in law, they use the term "res ipsa loquitur," meaning that "the thing speaks for itself." used in association with tort cases, it references the idea that there are some events which just don't occur without cause, and hence that there was some negligence or mistake involved. i think this is one of those events. from what is known, the situation involved a young man (age 26) with no known history of medical problems (as far as we know) in a state of supreme fitness (Fran was an elite multi-sport athlete--not only was he among the top long-distance swimmers in the world, he was also a very good runner, having qualified for the Boston marathon). this suggests that whatever happened, it didn't happen with him, but rather with the race itself. race conditions were unusual. perhaps not for Abu Dhabi, where it was held, but certainly for long-distance swimming. Fran reportedly told his coach the ambient air temperature was >100 degrees F and the ambient water temperature was around >87 degrees F. ocean temperatures typically vary, with patches of water having varying degrees of warmth or cold. this means that given the distances involved, the swimmers at the race probably went through sections of water above and below 87 degrees F.
swimming in warm water is hard. very hard. and 87 degrees F is very warm water. it's analogous to running in temperatures >100 degrees F. water that warm acts as an insulator, meaning that it makes it hard for the body to release heat through perspiration, accelerating the rise in core body temperature caused by physical exertion. this raises the risk of dehydration, overheating, heat exhaustion, and heat stroke. on a personal note, i've had swim workouts in a swimming pool used by platform divers kept at ~75 degrees F, and i felt like i was overheating (even though the ambient air temperature was ~65 degrees F). i can't imagine what's it like to be swimming in water above 80.
athletes who have not acclimated to heat will struggle more in warm conditions. this is true for runners, and i suspect true for swimmers. i don't entirely know for certain, but some news reports indicate that Fran had been training in the coastal waters of Southern California, which are notoriously cold (especially this past summer, with water temperatures around 55-60 degrees F). this means that he was used to cold water swimming, and would not have been acclimated to the conditions in the UAE. regardless of acclimation, given the difficulty in race conditions race organizers should have increased their monitoring of athletes. long-distance swim races do not have "aid stations" like they do for marathons, and athletes are expected to have their own nutrition (typically, they keep gel packs in their swimming suits). but i'm starting to think they should. in long-distance running, race organizers provide aid stations for specific reasons: a) provide medical check-ups of athletes, and b) provide nutrition, including fluids to help athletes cool. race organizers also have medical observers patrolling the race course. and the tougher the race conditions (i.e., hot days), the more attention is given at both the aid stations and on the race course. even for elite athletes. given the demands of distance swimming, i think it would only be logical that race organizers increase their monitoring of athletes and allow hydration, even if only for those athletes in distress. the temptation for race organizers is to treat elite athletes as an exception to race management, that because the competitors are supreme physical specimens that it allows race organizers to ease their responsibilities in managing the race. this is a fallacy, because a) elite athletes still require care because they are pushing themselves to the physical limits, and are mentally so driven that they may very well push themselves over the limit (i.e., they may push themselves so hard that they lose their mental faculties, to the extent they cannot recognize when they are trouble or even recognize what is happening), and b) every one deserves a well-managed race--everyone--and no race organizer should ever absolve themselves of their responsibilities to the human lives that have been entrusted to them. legally, i know that many races require athletes to sign liability releases, but i don't think that these releases are blanket licenses for criminal mismanagement and outright dereliction of respect for human life. the race organizers are quoted as saying that Fran died from "fatigue." i don't buy that for a second. who are they kidding? an experienced world-class athlete facing the premier event of his race season? fatigued? there must have been an error in translation or a mis-statement by someone unfamiliar with sports medicine or a poor transcription from a news reporter, because it just doesn't make sense. apart from this, i also want to say that what happened brings up an issue that i've written about before: knowing when to quit. if elite athletes are saying race conditions are tough, then it is tough. in which case, everyone involved--race organizers, athlete support crew, even athletes themselves--all should be making efforts for better care and greater caution. this means that a) somebody should have said something at Abu Dhabi, and 2) somebody should have done something. i don't mean they should have called the race off (although it appears that after Fran's death and athlete complaints about the race conditions, a later longer-distance race at the same location was canceled), but i do think that at the very minimum race organizers should have taken note to increase their precautions. and i also think that support crew (including coaches, trainers, doctors, etc.) and competitors should have escalated their concerns about racing, even if it meant going so far as to make individual decisions to quit or perhaps not even start (the dreaded "DNF" and "DNS," respectively)--or having someone make the decision for them to do so. this latter point is something that probably runs contrary to the popular perception of athletic spirit. as an athlete it's sometimes hard to make a decision regarding quitting. it's not a value that sports encourages. if anything, sport is about the opposite: persistence in face of all challenges. and in the heat of competition, with the build-up of expectations carried over from training, the will to persevere can be overwhelming. my argument, however, is that sometimes this kind of mindset can lead to a loss of perspective. sports is, among other things, about developing persistence, and this is laudable in terms of personal character development. that, however, is where the dividing line can be identified and is the reference point from which we can locate perspective: development. sports gives us values for a purpose, and that purpose is about making ourselves better. physically. mentally. spiritually. as all-around human beings. it is not about self-debilitation. it is not about self-destruction. it is not about death. it is because of this that i believe we as athletes have to take time outside of training and racing to figure at what point we are willing to quit...and, because we sometimes push ourselves to states where we lose our mental faculties, when we are willing to accept someone else making us do so. we can't trust race organizers to do these things for us--what happened in Abu Dhabi is a clear example of this--even though they may be responsible. to protect ourselves from whatever negligence or mistake may be made by others, we have to take the precaution of deciding for ourselves (hopefully, when our faculties are clear and our perspectives are in order) when discretion is the better part of valor and when we are willing to accept something as being self-destructive versus being self-constructive. and then we have to commit to following through on our decisions on race day. the reason i'm stressing this is that as athletes we sometimes become centered on ourselves, particularly in terms of how we're feeling and how we're acting. the resulting tendency is to become self-centered, sometimes to the extent we lose track of everything else around us. which is fine to a degree, since sports is about self-development. but we are more than just athletes; we are also human beings. and sports is meant to be about development that complements living as human beings...and human life is never about only ourselves, but also about everyone else around us, particularly others who are close to us in our lives. in which case, we have to be mindful of what we represent to others and the value our presence has in their lives. as such, being self-destructive isn't just about hurting ourselves but also about hurting everyone else in our lives; it's about making the world worse. conversely, being self-constructive isn't just about improving ourselves but also about improving the lives of others around us; it's about making the world better. and if the worst possible circumstance comes to pass and our time on this earth really does come to an end, which of these possibilities do we want to be the testament to our lives? which of these do we want to have given our best efforts? which of these do we want others to get from us? one of the things that they never tell you when you're being recruited into athletics is that it involves pain. and not just a little, but a lot. and not just possibly, but certainly. sports, in short, hurt. while such a failure to disclose is not a lie, it is an omission of a material matter, since it has the consequence of subverting our decision-making process by taking out a factor that most of us ordinarily would choose to avoid. as a result, a fair number of newcomers to active lifestyles invariably end up finding themselves afflicted by a measure of discomfort that they never really expected and in a magnitude that they never really encountered. unprepared and ignorant of how to deal with the pain, they often become overwhelmed by an experience entirely contrary to what they had been led to believe. intimidated, they then do the one thing most logical but ultimately most counter-productive: they quit. there's a frequent perception--sustained by both sedentary and active communities--that this is just the way things are, and that sports and athletics are things reserved for those of special character, and that they serve as a litmus test revealing those who have the fortitude to deal with hurt and those who lack the qualities to persevere. the mindset is that sports and athletics is the domain of the strong, and that it seeks to weed out the weak. this attitude is reflected in the mantras recited as part of everyday lore: "either you have it in you or you don't," "either you play or you get played," "either you're a player or you're a player-hater," "only for the strong," "only for the brave," "only for those with guts," "you're not in the club," etc. the underlying message tied to this reference frame is that the ability to participate in sports or athletics is genetic, with athletes being those who don't feel pain and non-athletes being those who do, or alternatively athletes being those who are "strong enough" to deal with pain and non-athletes being those who are "too weak" and crumple before pain. this is unfortunate, because it runs entirely contrary to the goal--a goal shared by so many in sports and non-sports community alike--of trying to promote active lifestyles in the general population, whether as a form of physical health or personal development. if the goal is to inspire and encourage more people to engage in athletics, then it is entirely self-defeating to delimit them before they even start. more than that, it's also just simply wrong. there has always been a contingent of coaches, athletes, and sports medicine personnel who have asserted that athletics can be taught. these perspectives have always argued that as much as athletic ability is determined by genetics, the ability to engage in athletics is not, but is instead something driven by the person and the person's environment. which means that 1) the ability to overcome the challenges of athletics, including the challenge of pain, is driven by a person's ability to deal with those challenges, and 2) such an ability is something that can be trained by the person's environment. in other words: people, if given the right coaching and right coaching environment, can learn how to deal with pain, and deal with it in ways typical and expected for athletes and athletics. if the link doesn't work, the full text of the article is at the bottom of this post. the implication of this is significant relative to sports: anyone can become an athlete. they may not be great, they may not be good, they may not be elite, but they can engage in sports, and in that sense they can be athletes. anyone can adopt an active lifestyle. meaning that the benefits of such a lifestyle are available to anyone willing, able, and accessible to appropriate training. on a personal note, i have to say this is something i've heard from almost every coach i've encountered: pain is something anyone and everyone in sports encounters and will encounter, but the difference between those who achieve their goals and those who don't is how they respond to the pain...and that response can be trained. i'll reference Chris Carmichael as an example. Carmichael, long-time coach of Lance Armstrong, always insisted to his amateur clients that Lance felt the same pain they did, but that he had learned over his personal and professional athletic career how to deal with the pain--and to not only deal with it, but to deal with it in ways constructive to his performance as an athlete. Carmichael would always stress that the tools Lance used to do this were the same tools that he taught to everyone, and that they were tools that could be used by anyone. the message of this is that no one, including newcomers and neophytes, should surrender their athletics too easily, and that they should recognize that active lifestyles and the benefits of active lifestyles are not genetically predetermined but things that can be gained with the right training. all you have to do is to choose to pursue it. and that means it is not destiny; it is choice. My son, Stefan, was running in a half marathon in Philadelphia last month when he heard someone coming up behind him, breathing hard. To his surprise, it was an elite runner, Kim Smith, a blond waif from New Zealand. She has broken her country’s records in shorter distances and now she’s running half marathons. She ran the London marathon last spring and will run the New York marathon next month. That day, Ms. Smith seemed to be struggling. Her breathing was labored and she had saliva all over her face. But somehow she kept up, finishing just behind Stefan and coming in fifth with a time of 1:08:39. And that is one of the secrets of elite athletes, said Mary Wittenberg, president and chief executive of the New York Road Runners, the group that puts on the ING New York City Marathon. They can keep going at a level of effort that seems impossible to maintain. “Mental tenacity — and the ability to manage and even thrive on and push through pain — is a key segregator between the mortals and immortals in running,” Ms. Wittenberg said. You can see it in the saliva-coated faces of the top runners in the New York marathon, Ms. Wittenberg added. Tom Fleming, who coaches Stefan and me, agrees. A two-time winner of the New York marathon and a distance runner who was ranked fourth in the world, he says there’s a reason he was so fast. But the question is, how do they do it? Can you train yourself to run, cycle, swim or do another sport at the edge of your body’s limits, or is that something that a few are born with, part of what makes them elites? Sports doctors who have looked into the question say that, at the very least, most people could do a lot better if they knew what it took to do their best. “Absolutely,” said Dr. Jeroen Swart, a sports medicine physician, exercise physiologist and champion cross-country mountain biker who works at the Sports Science Institute of South Africa. “Some think elite athletes have an easy time of it,” Dr. Swart said in a telephone interview. Nothing could be further from the truth. One trick is to try a course before racing it. In one study, Dr. Swart told trained cyclists to ride as hard as they could over a 40-kilometer course. The more familiar they got with the course, the faster they rode, even though — to their minds — it felt as if they were putting out maximal effort on every attempt. Then Dr. Swart and his colleagues asked the cyclists to ride the course with all-out effort, but withheld information about how far they’d gone and how far they had to go. Subconsciously, the cyclists held back the most in this attempt, leaving some energy in reserve. That is why elite runners will examine a course, running it before they race it. That is why Lance Armstrong trained for the grueling Tour de France stage on l’Alpe d’Huez by riding up the mountain over and over again. “You are learning exactly how to pace yourself,” Dr. Swart said. Another performance trick during competitions is association, the act of concentrating intensely on the very act of running or cycling, or whatever your sport is, said John S. Raglin, a sports psychologist at Indiana University. In studies of college runners, he found that less accomplished athletes tended to dissociate, to think of something other than their running to distract themselves. “Sometimes dissociation allows runners to speed up, because they are not attending to their pain and effort,” he said. “But what often happens is they hit a sort of physiological wall that forces them to slow down, so they end up racing inefficiently in a sort of oscillating pace.” But association, Dr. Raglin says, is difficult, which may be why most don’t do it. Dr. Swart says he sees that in cycling, too. “Our hypothesis is that elite athletes are able to motivate themselves continuously and are able to run the gantlet between pushing too hard — and failing to finish — and underperforming,” Dr. Swart said. Finally, with more experience, Dr. Swart became South Africa’s cross-country mountain biking champion in 2002. Some people focus by going into a trancelike state, blocking out distractions. Others, like Dr. Swart, have a different method: He knows what he is capable of and which competitors he can beat, and keeps them in his sight, not allowing himself to fall back. Kim Smith has a similar strategy. And, yes, she does get saliva all over her face. ok, i'm going to see if can get a little bit of a jump on this year's Blog Action Day. it occurred to me that the rest of the global internet community will be well into this event by the time daylight comes to the Pacific coast of the US, so i better post this early so it can join the rest of the international operation. for those of you who don't know, Blog Action Day is an annual occasion (for 2010, on Friday, October 15) of global internet activism, where bloggers around the world cooperate together to highlight a particular issue. the idea is that if many bloggers all make posts about the same issue at the same time it will garner greater public attention, and thereby awareness, for the issue of concern--and thereby hopefully have a greater chance of motivating a response to fix it. my contribution Blog Action Day in this post will to concentrate on water in the coastal regions of the planet. for those of you involved in the endurance sports community, particularly those of you living in coastal areas, this is something of which you are no doubt already intimately aware. you are as aware of it as much as any of the other members of the aquatic recreational community, including swimmers, surfers, boaters, etc. some of you may belong to multiple groups, and hence have even more exposure to shoreline waters. regardless of the group, however, we share the same waters and we share the same recognition that the state of the waters along our coastlines is something with an immediate impact on our lives and something which we can monitor within our daily consciousness. to borrow the academic term for this, it is something salient to us. i am sure that each of you has encountered days when you realized that our coastlines are not as clean as they could be nor are as clean as they should be--ans in some situations nor as clean as they need to be. it may have been via a news report, a public warning, a friend's mishap, or even your own personal experience. regardless, it involved something that threatened the health of the water and in so doing threatened the health of you and others around you. those kinds of experiences are not unique to you nor your community. they are becoming increasingly commonplace. whether as a result of development, industry, waste, consumption, or overuse, coastal waters are becoming increasingly damaged, sometimes to an extent harmful to life--not just marine life or littoral life, but all life, including our own. this is true not just for those of us in Southern California or the Pacific Coast of the US, but for coastal waters around the world. in which case, they should be taken as an alert to all of us to recognize the deteriorating condition of our shorelines and to start taking action to fix them. just as the problems facing our coastal waters impact more than just us as individuals, so too the solutions for our coastal waters involve more than just us alone. if we want to fix them, then we need to work together in a collective effort that produces a clearly significant long-term solution. i'm not going to say much more than this, since i don't want to belabor the point and come across as preachy. but definitely take a look at the above links, and take some time to check out Blog Action Day. and if you feel sufficiently concerned, feel free to support these organizations--or similar organizations in your coastal region if you are not from Southern California--in their efforts to improve the health of our shoreline waters. it's not just about you, it's about everyone and everything else. "where does the power come from to see the race to its end? the modern Olympic movement drew much of its spirit from the late Victorian/early Edwardian British school sports ethos. when Pierre de Coubertin revived the Olympics in the late 1800s he sought to replicate on a global scale the lessons found in athletics by the British educational system. because so much of modern sport derives its worldview from the Olympics, it is from this that we have developed many of our notions of athletics as being associated with character, virtue, and values, including those of courage, commitment, cooperation, composure, discipline, diligence, decisiveness, sacrifice, sportsmanship, and truth. it is also from this that we find the premise of sports is not about victories or records, but rather about development of the self attained through competition with others. the temptation is to think that since that time the nature of sport has changed, and that such ideals are antiquated, romantic, unrealistic, hopelessly sentimental daydreams of an outdated, delusional, and by some accounts misguided era. in the years since Victorian & Edwardian England, the focus has very much become one of victories and records, promoted as epic story via drama built upon high stakes raised by national pride and unimaginable wealth and unlimited glory. it's easy to think that development of the self was a quixotic delusion. but such a perception is dangerous. because it leads to cynicism. and cynicism leads to despair. and despair leads to a loss of faith. and a loss of faith leads to an abandonment of ethics. and without ethics, victories and records becomes ends in themselves, justifying their achievement despite whatever costs--despite all costs--to ourselves and to our surroundings. it's no wonder that so many see no point to running a straight race. which is unfortunate, because such a perception is also a fallacy. because no matter the glory or wealth or pride or stakes, no matter the drama or the story, no matter the victories or records, we can never get away from ourselves. because everything fades and is erased in time, leaving us just with what we began, and we began with us alone. which means that we do in sport is not the result of anything other than what we do ourselves. and that who are as athletes is a reflection of who we are as people. and how we compete is a reflection of how we live. and how we live is who we are. so when our race is run we should be able to say we ran it true. in which case, sport is not about victories or records, no matter all the pressures to the contrary, but rather instead about the only thing that remains when all of it is done: the self. on the eve before my first Ironman, i was a near-total wreck. like so many others, i came into race day in a state of nerves that expanded exponentially with every passing moment in a mixture comprised of equal parts uncertainty leading anxiety driving fear causing neurosis producing dread becoming awe approaching paralysis in the face of something on a scale so vast, so great, so massive as to be utterly incomprehensible. my only singular thought on race day morning was: who am i to even dare? who am i to even try? who am i to even be? it was not a good state of mind to be in for an Ironman. "i know what you're thinking. we've all been there. everyone goes through it. everyone. all the time. but know this: to do an Ironman, you have to believe. you have to believe you can do this. you have to believe that no matter what, you have what it takes to get you through this. now you don't have to believe in destiny, you don't have to believe in people, you don't have to believe in God, you just have to believe in yourself." what he said, of course, applies to many things other than just Ironman. but i think Ironman stands as a ready metaphor for any challenge we may encounter involving magnitudes in spectacle, consequence, and meaning beyond our ken. these kinds of challenges involve moments of supreme uncertainty, tied as they are to a personal awakening to the limitations of our mortality and a realization of just how insignificant we are before all that is unknown in the infinite spaces of eternity. in these moments, we go beyond what is known. we go beyond fact. we go beyond the bases of reason. we enter a realm where there is only belief. the problem for us, however, is about belief in what. because belief in destiny can be unrequited. destiny is fickle, destiny is not kind. events that seemed destined end up evaporating in futility. things that seemed destined end up being taken away. lives that seemed destined end up being denied. destiny cannot be understood. people are no better. if the history of our species has proven anything, it is that people are helpless to their humanity, fragile and frail and prone to the forces of our existence, both of our own making and of our own circumstance. the workings of others cannot be known. as for God...or gods...let's not get started. for some it helps, for some it does not. it's purely subjective, supremely personal. take from it what you will. but the supernatural, the sacred, the divine, by definition cannot be substantiated. you don't have to believe in anything, you just have to believe in yourself.